I thought the most appropriate thing to do is to choose my favourite Climate Change web 2.0 tool and share it. So here it is! Bloom (Smart choices for the carbon conscious) is an interactive tool from the BBC that lets you explore what to do about CO2 and read about how each action contributes to the world. 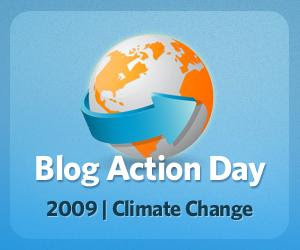 Then you can select which actions to pledge to and strive to act carbon consciously. 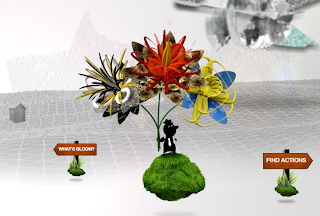 There are two versions of Bloom: a basic version and an animated version. Needless to say, the animated version is amazingly beautiful. You can give it a try yourself and use it to introduce the topic of climate change to your classes! I have been reading about Digital Game-Based Learning (DGBL) for a while and besides having read Marc Prensky's book, I came across Kyle Mawer's wiki and then was directed to Digital Play, a great blog about DGBL authored by Graham Stanley and Kyle Mawer. 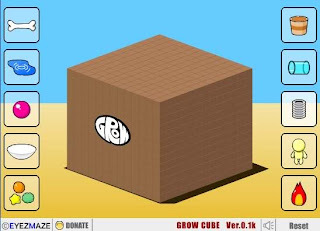 Based on a great idea by Kyle Mawer taken from Digital Play, a couple of weeks ago I used Grow Cube with my intermediate students and it worked wonderfully! I used the computer lab where we can sit 2 or 3 students per computer. First, I let students play around to familiarize with the game idea. Then, I asked them to reset it and to listen to me carefully as I gave them the right order one by one. After each one, they had to observe what happened and narrate it in written form. At the beginning they thought it was really easy, but then realized it got more complicated each time! As they watched, they started thinking and asking about the right words to describe what they saw. The result was really fascinating as each student produced a text according to their own linguistic ability. And they loved using a game! As a follow up, I pointed to the other Grow games available (on the left hand column of the game) and told them that if they felt like playing them and found the solution, we would play in class but they would have to give the instructions orally for the rest of the class to be able to win the game!